Hi, I'm new here, and I am jumping for eagerness to dive into the world of fall making. I need to know the best ways to mount tubular crin to hair falls. I need them to be professional quality, can't risk them to slide off. I need to decide wether I keep tieing them to hairbands, or start sewing them into strips of fabric. My scalp is too sensitive for heavy stuff, so no rexlace for me, but it might work on the ones I want to sell. Any suggestions what kind of knot to use? Off to read tut now, thanks girls! Rexlace doesn't actually add that much weight to it to be honest. I only ever use about 10-15 pieces per fall (30 strands total). 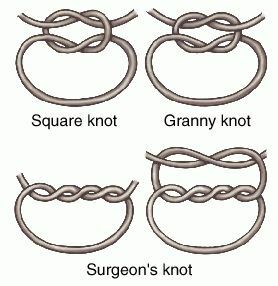 Just a simple knot does the trick! Thanks for the knotting info sweetie! That tutorial was really usefull actually, from doctored locks. Incase you didn't check it out you should. I liked it. Thanks for posting it!